Especially designed for warm pool group-exercise, this session will emphasize posture, balance, gait, proprioception, core strength, and function. This workshop is ideal for instructors teaching populations that need to improve fitness, while having options and progressions to meet a variety of health needs. Pain impacts function. People living with persistent pain commonly exhibit muscle guarding, inappropriate muscle recruitment, and/or inappropriate motor sequencing. These movement characteristics are often the beginning of a downward spiral, as increased pain couples with decreased physical activity. The resulting structural degradation will impact alignment, balance, gait/ambulation, endurance, strength, ROM, body composition, ADLs, social interaction, mental and physical health. With better understanding of neuropathic pain, practitioners and people in pain can work to offset functional changes and improve quality of life. This course is intended for anyone treating, educating, and optimizing function in patients with chronic pain. Research supports: people participating in aquatic therapy report decreased pain, improved exercise adherence, and increased function. This session will examine research outcomes, and aquatic techniques to reduce neck pain due to arthritis, injury, stress, repetitive strain, and poor posture. Pool protocols will include: pain reduction, restoration of functional range of motion, AquaStretch™and strengthening exercises. Identify injuries and alignment issues in the cervico-thoracic spine and shoulder girdle that cause neck pain and movement dysfunction. Explore research regarding best practices for treatment of neck pain, including restoration of function. Demonstrate and practice exercises and stretches to reduce neck pain and improve function. This land-based workshop will present aquatic exercise strategies to optimize hip function. Exercises to restore functional load bearing, improve range of motion, strength, balance, and gait; will be addressed. Hip strategies presented in this session will be appropriate for patients, pre- and post-hip replacement, as well as people with compromised hip strength and function. 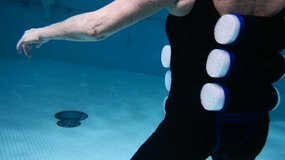 Balance, gait, and fall prevention will be emphasized using vertical aquatic techniques. Neurological impairments may benefit from these exercises, but are not the focus of this session. 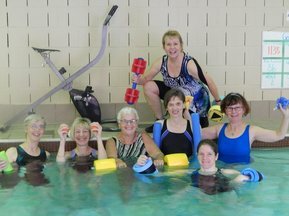 This workshop will address aquatic therapeutic exercise for people with osteoarthritis or rheumatoid arthritis affecting activities of daily living (ADL). We will examine research outcomes, discuss and practice aquatic training techniques to decrease disability, including: optimizing functional range of motion, building strength, and improving balance and gait. This workshop teaches a holistic approach to arthritis, designed to increase movement and exercise adherence, improve function, and decrease hypo-kinetic disease. Individualized as well as community-based group exercise programs will be addressed. This session will address common issues affecting balance and explore vertical aquatic exercise techniques to improve balance and core strength. Research driven, clinically proven training strategies will be used to stimulate and improve relevant systems. Practitioners requiring core strengthening exercises will discover useful techniques to help clients train functional core strength, while challenging and improving balance. People with health issues such as arthritis, FMS, back pain, MS, joint replacements, and diabetes, can benefit from regular exercise. However, fatigue, and fear of pain often limit their participation in land-based exercise programs. While warmer water is often preferred, it is not always available. These populations can become active through modified aqua fitness programs in recreational pools. This session will discuss programming ideas, and movement modifications appropriate for people with a variety of health concerns. This workshop will highlight the benefits of exercise during and after pregnancy. Participants will learn about precautions and contraindications for exercise during the childbearing year. Safe, effective class design for this special population will be addressed. This session is a must for personal trainers, group fitness or aqua fitness leaders who work with pregnant clients. (This can be offered as a ½ day workshop, or a full day course). The back of the body (limbs and trunk) is often ignored and disproportionately weak. Strong musculature on the back side of the body promotes better posture, balance, and function. This interactive workshop will explore aquatic techniques to strengthen all things ‘backward’, for a strong healthy future. This session is for leaders and trainers who work with people who have had breast cancer. We will address the physical and emotional issues involved with exercise during and after treatment, and help you encourage a healthy, positive outcome for your breast cancer clients. Personal trainers, land and water fitness instructors who work with people after breast cancer diagnosis and treatment, will benefit from this information. The majority of our population will experience back pain or injury at some point in life. This session will address common causes of back pain and the benefits of aquatic exercise. Crunches are out; balanced core strength is in. Learn how to create an effective core training program for the water. Personal trainers, aquatic instructors and those engaged in post-rehabilitation will learn useful aquatic techniques to help clients create functional core strength and prevent back pain. This full day course is intended for leaders who wish to become Trainers and workshop presenters. T4T teaches successful strategies for engaging adult education. Content can be applied to any discipline. T4T is required to become an AQX course trainer. Strong AQX leaders are encouraged to become workshop presenters in their areas of expertise. On-line options coming soon! People with persistent (chronic) pain need to know there is good news about their condition. Research is helping explain the chronic pain mechanism. Trainers who work with chronic pain clients can teach coping skills and simple techniques to reduce persistent pain and improve exercise tolerance and quality of life. Active or latent trigger points as well as fascial adhesions can result in muscle pain, decreased range of motion, muscular weakness, and hyper-reactivity. This workshop will explore effective techniques to resolve common trigger points and myofascial adhesions. Effects of unresolved soft tissue issues will be discussed, along with self and facilitator strategies for everyday use. AquaStretch™ Technique, which can be used for dry land or aquatic myofascial release, will be demonstrated and discussed. Many people experience neck and upper back pain on a daily basis. Whether neck pain results from arthritis, injury, stress, repetitive strain, or poor posture, the right exercise can help. Learn to avoid aggravation of these structures, and make your land or water training sessions part of the solution to neck pain. Land and water-based personal trainers who work with clients following rehabilitation will benefit from this session. Target markets, health screening and liability issues will be discussed. Best practices for a variety of common health issues will be outlined, including: Client assessment, post-rehab exercise techniques, and progress benchmarks. Participants should be certified Personal Trainers. Why do I have to pee when I get in the pool? I feel like I’m working hard, but I can’t get my heart rate into my target zone! This theory workshop will explore the effects of immersion on the body. Participants will learn how and why aquatic exercise has such profound and beneficial effects on our physiology. This is great information to pass along to your aqua classes! Aqua fitness leaders frequently complain about class members who focus all their concentration on conversation, rather than exercise. This session will identify key obstacles to participant engagement. We will explore solutions and practice techniques to focus your class, providing a win-win for instructors and participants alike! Trainers & instructors who work only on land are missing the boat! This session will explain the unique properties and benefits of water as an exercise medium. We will compare the advantages / challenges of aquatic versus land-based training, and clarify the physiological effects of immersion. Discover the amazing benefits of aquatic exercise for a variety of populations. Use this great tool – get to the pool! Group aqua fitness classes that use the entire pool (both shallow and deep end) throughout the class, optimize participant preferences, while allowing full usage of pool space. This workshop will identify which aqua fitness movements work well in chest deep vs deep water. You will learn the art of multi-tasking required to teach simultaneously to both depths of immersion, modify movements appropriately for each depth, and keep muscle usage patterns similar. If you like a challenge, this is the workshop for you! Effective upper body training begins with sound cueing, mental focus and a stable core. This session will review important muscle groups to train at the shoulder girdle, shoulder joint, and torso. Key anatomical structures will be highlighted, followed by an opportunity to explore and create appropriate training stimuli in the water. Personal trainers and group aqua fitness leaders will learn functional upper body training techniques for the pool. Take a step beyond the ‘usual’ to harness the powerful potential of vertical aquatic training. We will discuss leadership strategies to encourage mindful movement in aqua fitness. Class and exercise design will be overviewed, considering: training priorities, muscle balance / overuse issues, strategies for smooth movement transitions and participant success, and techniques to make the most of the water as a training medium. Mindful Movement will be practiced and experienced in a practical pool session. Do you sometimes get stuck between a jog and a jack? If you have lots of great moves but have trouble making them flow, this workshop is for you. Learn to successfully sequence your group aqua fitness movements to create safe, enjoyable, effective classes. Leaders will practice motivating movement transitions in the classroom and pool. Are you bored with doing the same old thing in the pool? This workshop will get you out of your ruts and help you explore your creativity. 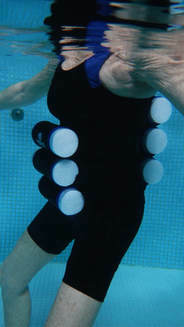 Patterning techniques will be reviewed and applied to effective aqua fitness movements. Participants will experience a dynamic pool class and have an opportunity to design their own creative aqua routines to take home. Are you out of your depth when you leave the pool floor behind? This workshop will overview the fundamentals of successful cueing and coaching for deep water or suspended aqua fitness participants. In the classroom and the pool we will clarify the unique qualities and challenges of deep water / suspended vertical aquatic training. If you are making the transition from chest deep to deep water, if you’re not satisfied with participant responses while suspended, or you just want to add some punch to the deep end of your pool, this session is for you! Discover the liquid weight room! Participants in this workshop will overview important muscle balance issues and identify key muscle groups to strengthen and stretch. Effective teaching techniques to harness hydraulic power for challenging aquatic muscle work will be demonstrated in the classroom and pool. Learn how to give your aqua class more muscle! Resistance training is an essential component in maintaining health as we age. Learn how to design muscle conditioning exercises for seniors using noodles in unique ways. Experience a chest deep pool session that demonstrates a variety of appropriate muscle conditioning and stretch moves for this diverse group. This practical pool session will use a case study approach to practice effective aqua personal training skills. We will emphasize technique and purpose in vertical water training at a variety of depths, and with a cross-section of fitness objectives. Exercise selection, use of equipment, observation and coaching techniques will be included. This session will be excellent for aqua personal trainers as well as group aqua fitness instructors who want to improve their teaching skills. Created by Connie Jasinskas • produced by Hydro-Fit USA, you can order below. Wave Rider provides stable, comfortable, adjustable pelvic flotation for deep water and suspended vertical aquatic exercise. Our instructor brought one to the pool and we had a chance to try it. When it was my turn I didn't want to hand it over to someone else. I have been taking aquafit classes for 30 years and this is the best device I have ever used for deep water fitness. It is comfortable, easy to use and so much better than a noodle alone. I highly recommend the Wave Rider for all ages. ​Topics and Registration Info Coming Soon! Continuing Education Credits • Great Education & Motivation • Connection with like-minded movement-motivators! Enrolment is limited • Register here as soon as the link is available, or contact ConnieJasinskas@mac.com for etransfer. The newest member of the AQX Family of Subscribers! University of Guelph - Course Dates TBA Soon - Stay Tuned! AQX Continuing Education Course - On Line! What is the biggest complaint among group aqua fitness instructors? If you said unwanted, unfocused class chatter and inattentive participants, you are RIGHT! You can take this AQX course to help you solve unwanted aqua class chatter. We consider why people attend your classes, and what to do to establish yourself as an exciting, enjoyable, respected leader. The course includes lots of practical solutions, a useful participant handout, and earns you 2 AQX CECs. "My mission is to provide the knowledge, resources, and motivation to help people become their best." This page provides an overview of programs and services offered by For the Love of Fit. Since 1984, I have provided quality education for exercise and rehabilitation professionals, as well as the general public. This website gives you access to a variety of my favourite teaching resources, training manuals, DVDs, and my book: Prescription Laughter. Links are provided to access other excellent products and services. Please use the search box in the header of this page to find items of interest. Fill out the visitor registry below to get in touch - I love to hear from you. Tell Us About You and Let Us Help!